Bhavan's Delhi Kendra, in tune with the vision of its Founder, has organized every year Bhavan's Sangeet Samaroh on its Foundation Day to pay tribute to its Founder Kulapati K. M. Munshi. Besides presenting eminent artistes in various segments of the Indian classical music, we have also brought out thematic digest namely "Swar Bharati" with a view to bring to the fore our ancient texts, the source of Indian classical music and Performing Arts. 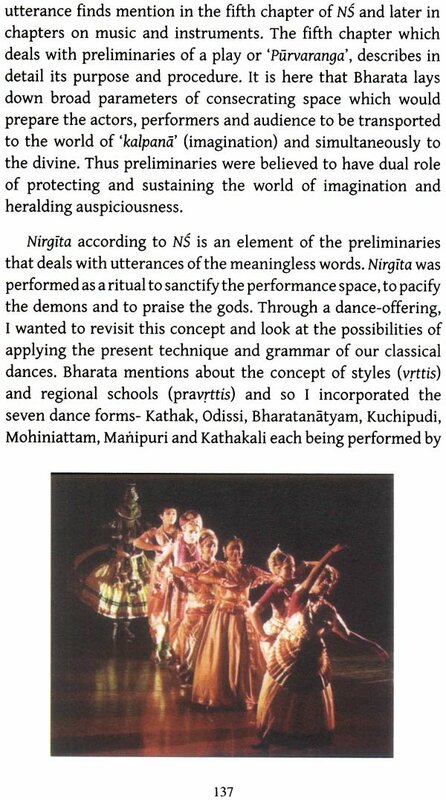 It is in this context that we first brought out a digest on India's heritage in Performing Arts, on the Instruments used in the Indian Classical Music and Dance forms of India and then on 'Abhinavagupta', 'Natyasastra' and 'Silapptikaram'. The articles in these issues were well received and appreciated by scholars, practicing artistes and the rasikas alike. A strong suggestion emerged from some eminent Indologists and Scholars that these volumes be converted into books so that the valuable information and knowledge given in the ancient text included in the articles "Swar Bharati" do not get lost. We have therefore decided to bring out a Series on various aspects of classical music, particularly on seminal texts being the source of Gita, Nritya and Natya (Music and Other Performing Arts) that have developed across India as suited to the genius of various regions. We present in this volume views of scholars, critics and practising artistes on various aspects of Bharat Muni's Natyasastra. Some of the articles have been sourced from the previous publications and included in this volume to add value to the collection. We hope that the readers would find this collection interesting and helpful in widening their knowledge on the contents of Bharatmuni's Natyasastra. Platinum Jubilees are milestones specially in the life of an institution. The Bharatiya Vidya Bhavan's journey over these decades is the flowering of the seeds which the late Shri K. M. Munshi planted. The Bharatiya Vidya Bhavan as an institution in India and abroad has played a vital role in communicating values enshrined in Indian tradition, ancient and modern. Its challenge has been to contain the wisdom of past, and of the demands, pulls and pressures of a new global society. This is an arduous task. The manifold activities of the Bhavan have been an example of how a vision is transformed into a plan of action in the different locations on India and abroad. The Delhi Kendra of the Bhavan has undertaken many important programmes in the field of education. of late it has given special attention to the presentation of Indian arts, particularly to the performing arts. This is a welcome addition to the cultural life of Delhi. The Swar Bhrati 2013 which will be released on the 6th November 2013 is an important landmark. 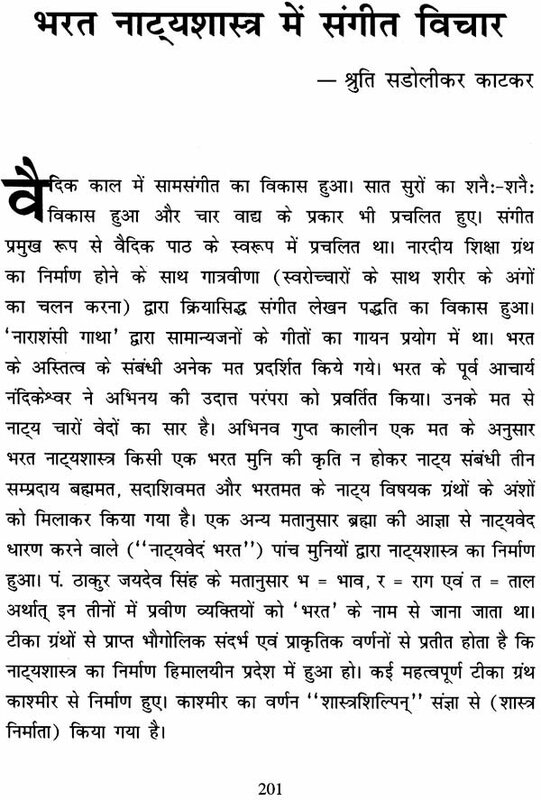 In the last edition of Swar Bharati, at the initiative of its new Director, Shri Ashok Pradhan, there were articles on that great and incomparable scholar and thinker, Abhinavgupta. The articles in that edition brought out the multi-disciplinary nature of the intellectual enterprise of centuries ago, but which has a meaning for the here and now of today. This year the Bhavan has decided to reach out to one of Abhinavgupta's great master, the one and only Bharata. 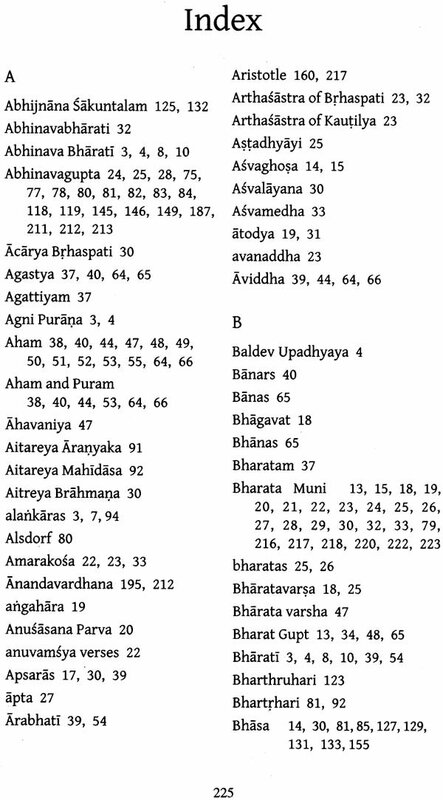 who was Bharata? Where did he live? Was he a person or was he only a pseudonym for the creator of text which has held the attention of scholars from the North to the South, East to the West, and beyond India? 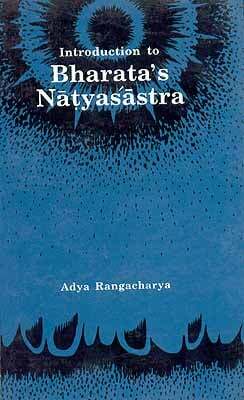 There is a body of scholarship on this seminal text, the Natyasastra. This could fill a library. 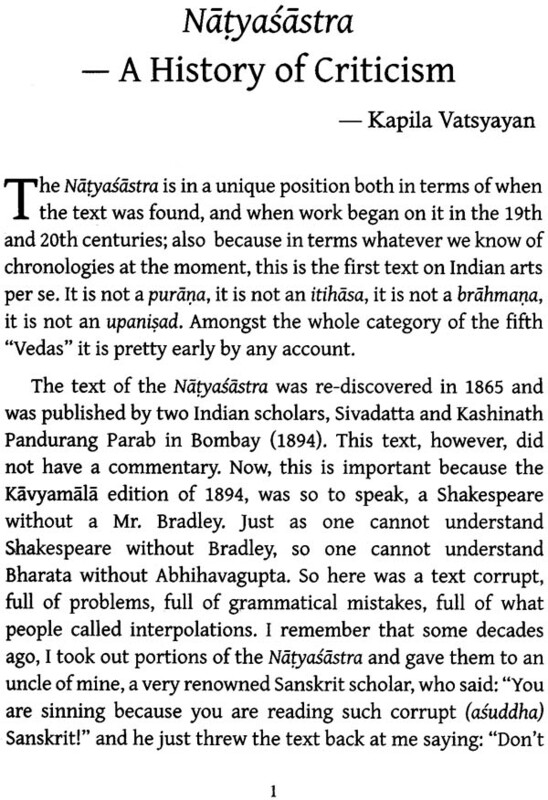 Discussions have ranged from questions of authorship, date, conceptual plan of the text, whether it is a compilation or work of a single author, the manuscripts and their locations, questions of recensions, commentaries, translations, and other work on Indian aesthetics where Natyasastra is pivotal. 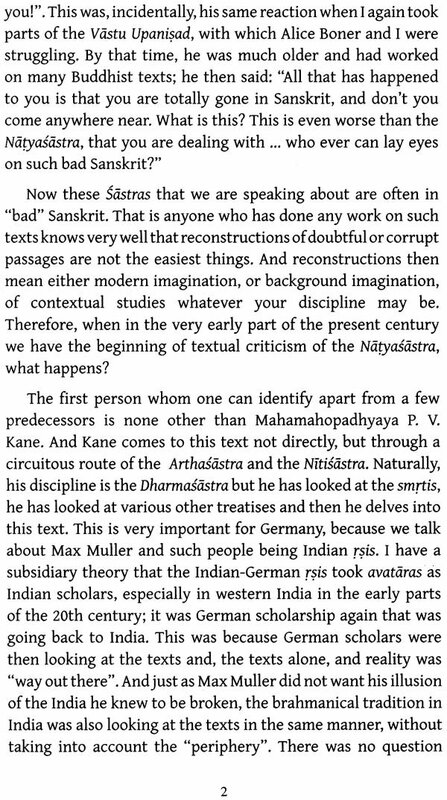 Besides, there is a recent history of scholarship on Natyasastra by foreign scholars as also Indian scholars, both philosophers and art historians. 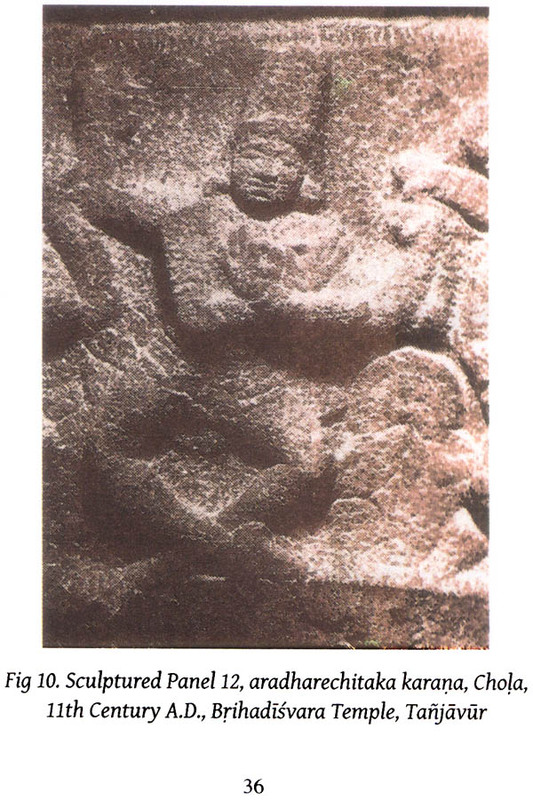 The text is crucial for identification and analysis of sculptural reliefs, ranging from Bharhut to Brihadisvara. The importance of the text in the artistic traditions of India is monumental and unparalleled. Its universality and relevance over a long period of Indian history is unquestionable. 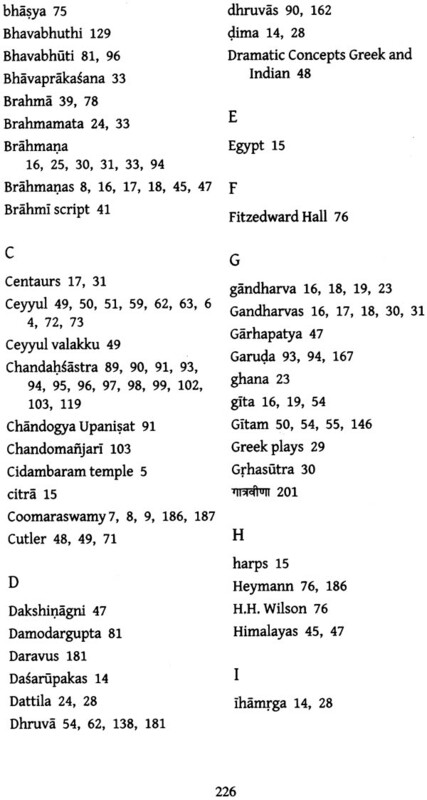 The Bharatiya Vidya Bhavan requested Bharat Gupt to edit this volume around the work on NiityaSiistra attributed to Bharata. Bharat Gupt, as a scholar who has traversed the literature on aesthetics from Greek sources to Sanskrit sources, has worked assiduously to bring out this slim volume on this significant occasion. The articles of K. D. Tripathi and Radhavallabh Tripathi address on set of issues, while those of Bharat Gupt and Kapila Vatsyayan address another set of issues. 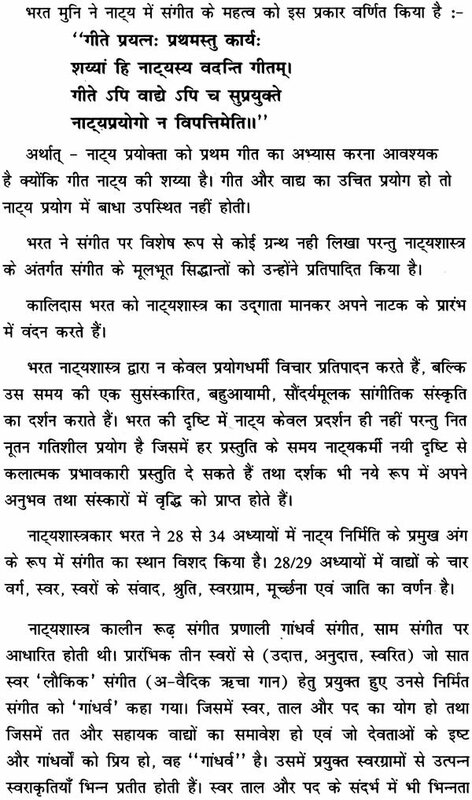 However the articles of Bharat Gupt, Kapila Vatsyayan, K. D. Tripathi and Radhavallabh Tripathi can be grouped together. While Bharat Gupt raises the question of dating of the Natyasastra, Kapila Vatsyayan recounts the history of recent scholarship on the Natyasastra in 19th and early 20th centuries. 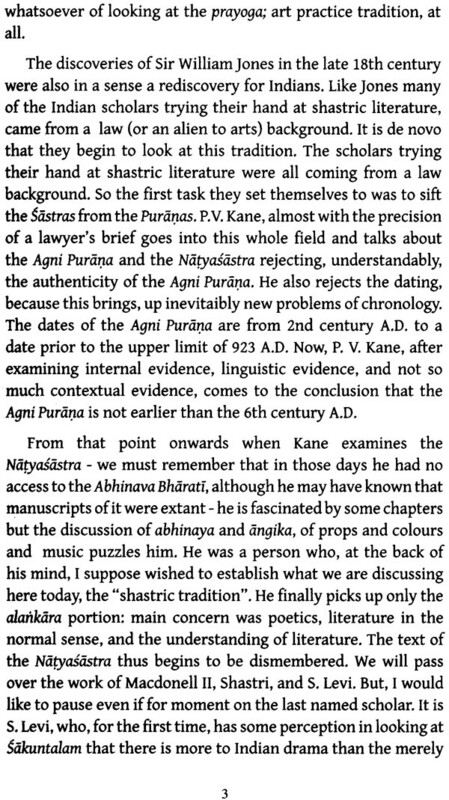 K. D. Tripathi's article raises a very important question of the different types of manuscripts and recensions. 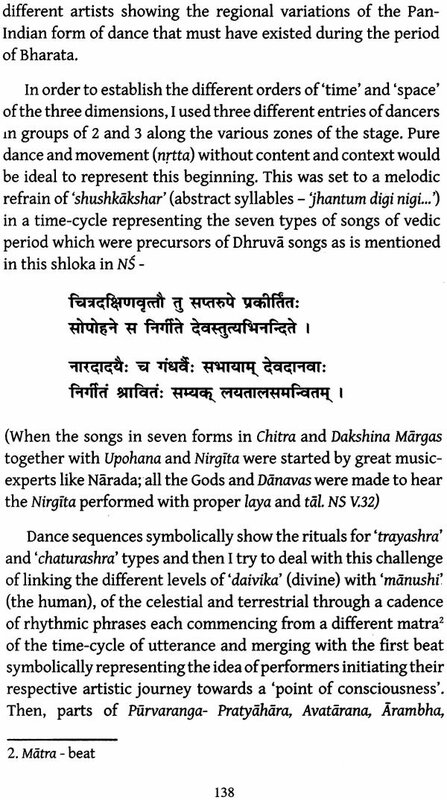 Radhavallabh Tripathi's article on Chhanda (meter) brings home the fact that the meter and metrical compositions are of the essence in comprehending the text and even for the determining authenticity. The Natyasastra tradition, as mentioned above, spreads all over India and also beyond the shores of India. R. Nagaswamy draws our attention to the seminal work on Tolkapiyam (a fundamental Tamil text of Grammar). 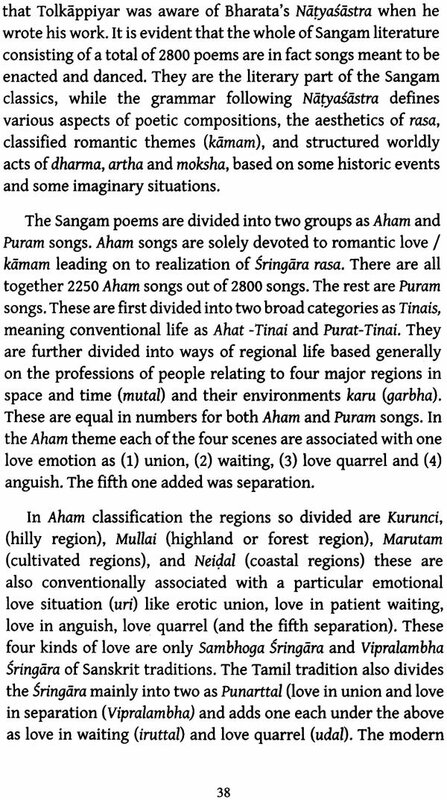 He has identified many commonalities between the two texts. 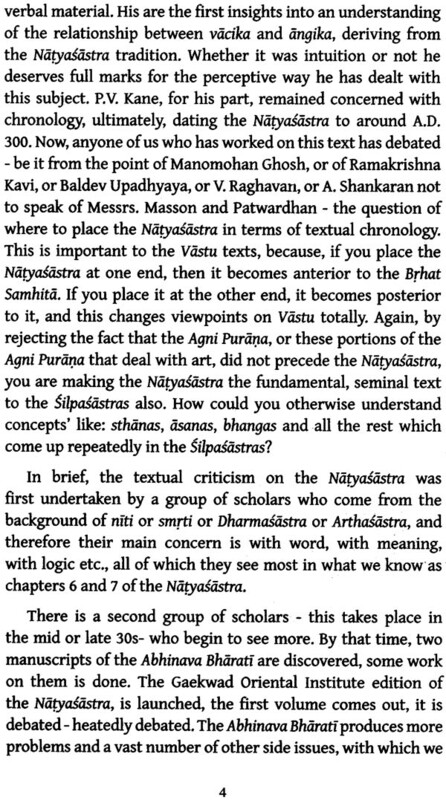 The text of the Niityasiistra has also had an unparalleled influence on the traditions of the visual arts, specially sculpture and painting. 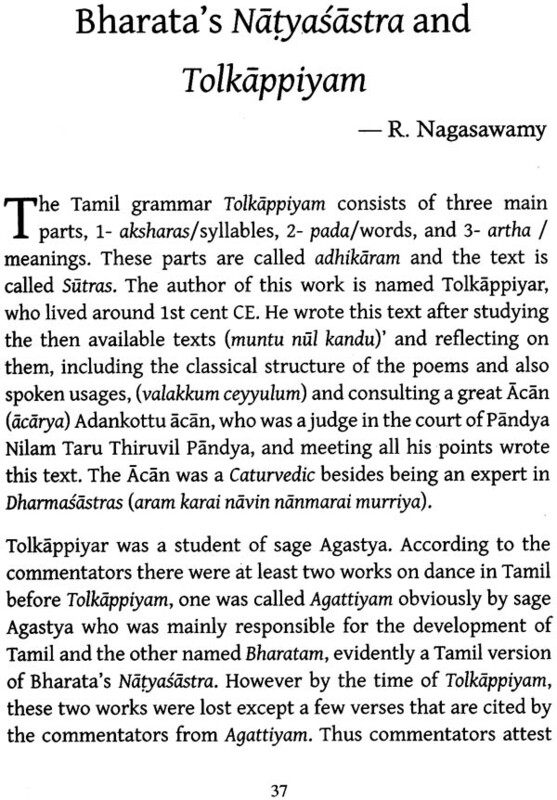 Volumes have been written on the subject by scholars, especially C. Sivaramamurti, not to mention my own work. 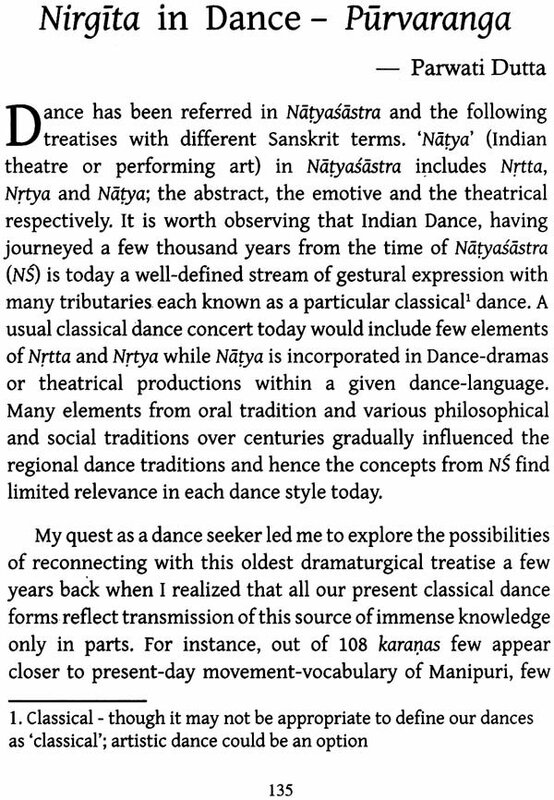 The Natyasastra, as it claims, is primarily an overarching text on theatre. Thus, the article of Kavalam Narayana Panniker assumes fundamental importance. One of our most distinguished theatre directors, he has built an edifice of contemporary theatre on the basis of the tenets of Natyasastra. His article is an eye-opener for those who are interested in examining the text and its outreach into different genres of theatre. As for music and dance, no one is speaking about the tenets of Aristotle or Plato as applicable to the contemporary classical ballet or modern dance in Europe. 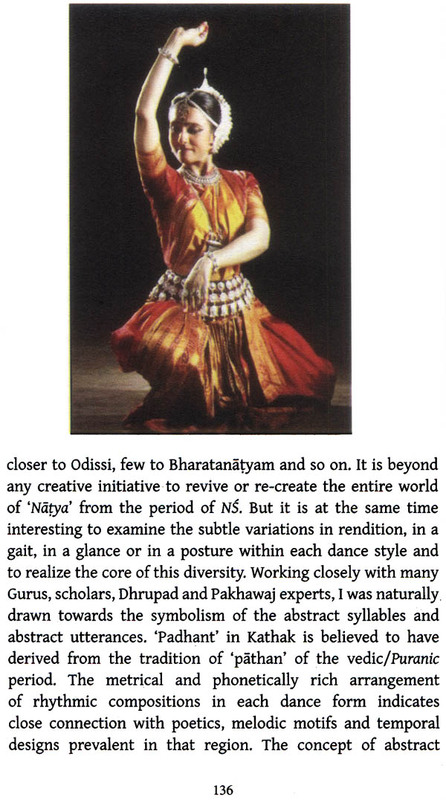 In India, in the context of contemporary classical dance styles and musical systems, everyone is speaking about the Natyasastra. This is in deep contrast to situation elsewhere in the world. No one is speaking about the application of Aristotle's Poetics to contemporary dance and music. In India just about everyone is speaking about it. Another group of articles, e.g. of Sanddhya Pureccha, Shovana Narayan, Sunil Kothari, Leela Venkatarama and Bharat Parwati Dutta, belongs to the category of how sastra and the prayoga are inextricably linked. 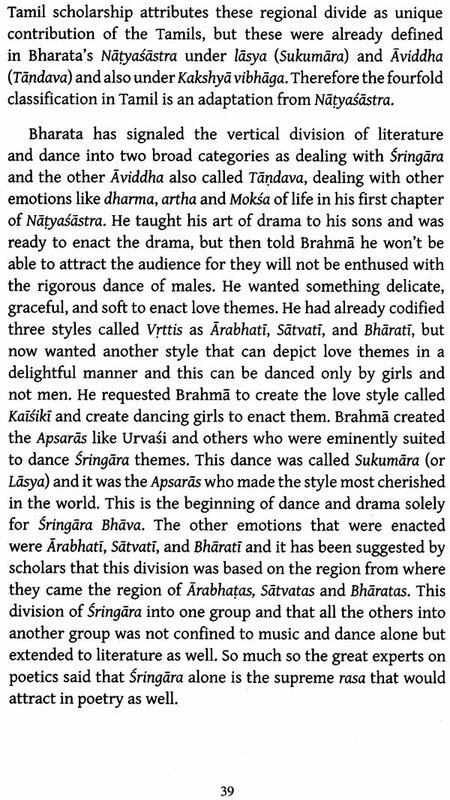 These articles are also indicative of the interpretation of the sastras into contemporary category of prayoga traditions. I have no doubt that there will be continued serious as also animates discussion on this unique, multi- dimensional text which, as I said in the beginning, is both ancient and contemporary and an unparalleled example of the dynamics of continuity and change in the Indian intellectual discourse. I am as honoured as humbled that I was asked to write this foreword.